Edwin Gilbert Izod, MBE (born 17 July 1876 in Portsmouth, died 2 October 1946 in Surrey) was a British engineer and inventor of the impact test that was named after him. Edwin Izod attended Vickery's School in Southsea. In January 1893, he began an apprenticeship at Maudslay, Sons & Field in Lambeth to become an engineer within for two and a half years. In 1895, he was sent by this company to Pembroke, where he installed the machines in the battle Cruiser HMS 'Renown' of the Royal Navy. Although Izod was only 19 years old, due to his mental and physical abilities, he was given the responsibility for superseeing the work in the main engine room with the strict order not to allow anyone who did not show a company ID. He followed this order, when he barred Captain 'Jacky' Fisher from entering the engine room, who then called him into his cabin and congratulated him on having carried out this order so diligently. After completing work on the 'Renown' he was sent to Portsmouth Harbor, to install Maudslay's engines into the battleship 'Caesar' and the cruiser 'Gladiator'. In 1898 he went as a demonstrator to University College in London, where he worked for almost two years. During this time he met a number of outstanding engineers in the laboratories. among them Captain H. Riall Sankey, who appointed Izod in 1900 as his personal assistant in the works of Willans & Robinson in Rugby. Influenced by Sankey's enthusiasm for the study of entropy, Izod devoted himself to it with the same passion and did much pioneering work developing the entropy theory for turbine design. While Izod was Sankey's assistant, he discovered, almost by chance, the importance of impacting the physical strength of metals. Sankey had been asked to examine a cracked tube of a shotgun for possible defects in the steel and instruct Izod to compare the metal to a flawless one. The two steels seemed to be very similar at first glance. 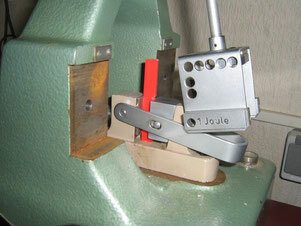 After all, Izod had the idea of placing small notched test pieces in a vice and hammering them with a hammer. Repeated strokes only bent one of them while the other broke at the first blow of the hammer. He did not do much to develop the impact test named after him any further, except that he informed a few friends in a circular about his discovery, but they ignored it. After assuming a higher position, eventually becoming Deputy General Manager, he was fully engaged in other work. In 1910, he was offered the position of Chief Consulting Engineer for Mechanical and Electrical Engineering by the Central Mining Corporation, and left England for Johannesburg, where he remained for 17 years. He was appointed Manager of the Corporation and in 1918 Managing Director of Rand Mines. In 1927, he retired just a bit more than 50 years old, but soon got bored and took the position as Managing Director of Weymann Motor Bodies Ltd. in Addlestone, when this was offered to him. This was "just for something to do", in his own words. In this capacity, and as chairman of the company, he worked intensively during the Second World War and significantly expanded the type of bodywork that they offered. Although his health was impaired for a long time, he devoted himself, until shortly before his death, with full attention to the affairs of Weymann's Motor Bodies Ltd., of which he was Chairman and Managing Director. Izod was Member of the Iron and Steel Institute, an Honorary Member of the Junior Institution of Engineers, and had served on the Committee of the Maudslay Society. 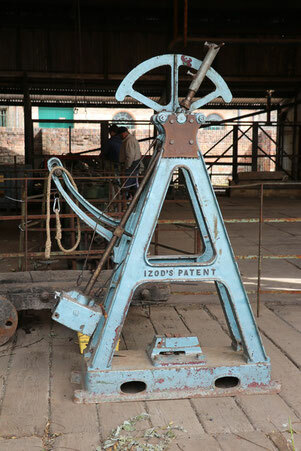 Although his name is widely known among engineers and metallurgists around the world, he is often not associated with the invention of the Izod impact test. This may be partly because he has pronounced his surname "Izzod", while the notched bump test is often spelled "IZOD" and pronounced "I-zod", and because he probably saw his discovery only as a minor incident in his long and active working life. 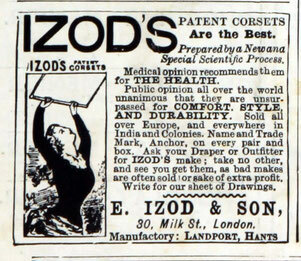 Edwin Izod Senior (born December 25, 1826, died 1887 in Southampton), the father of Edwin Gilbert Izod, was a British corset manufacturer, whose factory was in the late 19th century at Commercial Place and in Jacobs Street in Landport, Hampshire. According to the records of his baptism, he was baptized in 1829 in the parish of St. Leonard's in Shoreditch. The 1881 census recorded that Edwin Izod's business employed 23 men and 337 women. According to the National Probate Calendar, Izod died in 1887 at Stanfield House, Southampton, less than 40 km (25 miles) from the birthplace of Edwin Gilbert Izod. 1946 Institute of Metals: Obituaries. In: Grace's Guide. Wedding Corset by Edwin Izod, Victoria & Albert Museum Nr. T.265&A-1960.